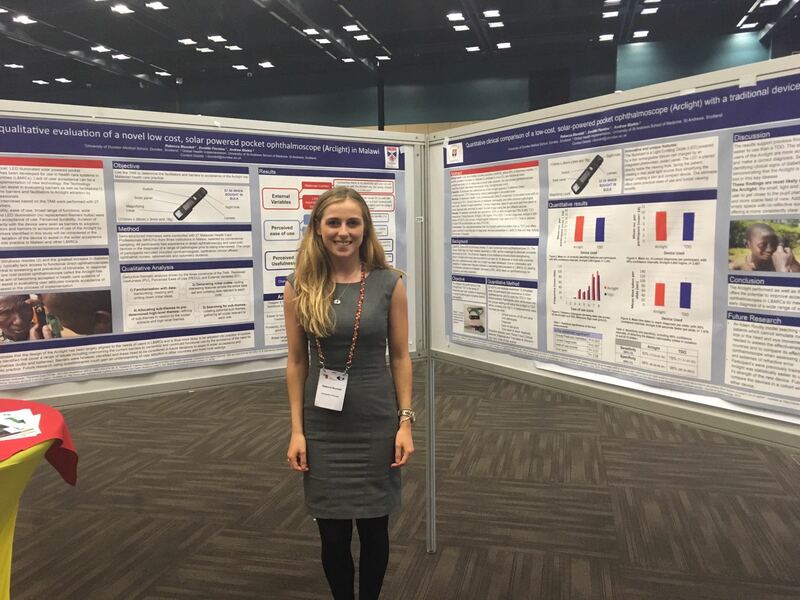 Rebecca Blundell, a University of Dundee International Health BMSc student presented her work on evaluation of the Arclight in Malawi at the International Association of Prevention of Blindness (IAPB) meeting in Durban. She attended the meeting along with her co-supervisor Dr Andrew Blaikie from the University of St Andrews School of Medicine Global Heath Team. The Arclight is a low cost solar powered ophthalmoscope and otoscope that offers health care workers the opportunity to diagnose conditions that may lead to blindness and deafness. The device has been developed through a collaboration with a number of organisations including the Fred Hollows Foundation, Arclight Medical, the IAPB and the School of Medicine, St Andrews. Rebecca was awarded a 1st Class degree for her dissertation ‘A mixed-methods evaluation of a novel solar powered low cost ophthalmoscope (Arclight) by healthcare workers in Malawi using the Technology Acceptance Model’ and went on to win the Sir James MacKenzie Intercalated Bachelor of Medical Science First Prize. The Arclight is available to purchase via the University of St Andrews online store.